Sometimes a great way to experience a city you love is to read a novel based in that city where the location is as much a character as any person. Chicago: A Novel by Brian Doyle is just such a book, which celebrates the city and the thousands of young people fresh out of college who come to it every year to start their lives. Mr. Doyle’s novel follows one such person (and the cast of characters he meets) and we are allowed to follow him and discover the city from the perspective of someone finding his way. This is not the greatest fiction ever, but a very nice book that is a perfect companion to fill the gaps on a trip – a trip to a place like Chicago perhaps. 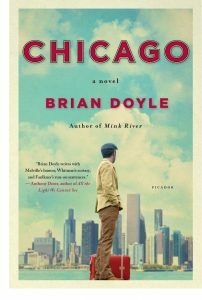 Chicago: A Novel by Brian Doyle is available from Amazon and other fine booksellers everywhere. Lost Cowboy is powered by	WordPress 5.0.4 and delivered to you in 1.870 seconds using 48 queries.